Even if your relative is being cared for away from the family home you can still have a ‘hands on’ caring role. It may be a good idea to think about how much time you will be able to commit to being involved in caring for your relative and then speak to a healthcare professional about how you would like to be involved and what you would feel comfortable doing. If your relative is too unwell to be cared for at home or, if you feel you need a break, the best thing for your family member might be to have a respite break in a residential or nursing home. This can be hard, you may feel guilty about seeking respite but the needs and preferences of your relative and your own needs must come first. Sometimes people just need a little break; both carers and those needing care. Clicking on the headings below will give you a summary of some of the options that may be available in your area. Hospices vary in terms of their style and layout but all hospice care seeks to improve the quality of life and wellbeing of people with a life-limiting or terminal illness, helping them to live as full lives as possible. If your care team have suggested that admission to hospice is advised it may be possible for you to arrange to visit beforehand to get a sense of the care they provide. Symptom management – it can be difficult to relieve some symptoms like nausea or pain while at home. A hospice admission allows 24 hour medical care – this will give healthcare professionals the opportunity to relieve these symptoms. Admissions will vary in length depending on individual circumstances. Respite – Respite care is provided for a few days or weeks to allow carer(s) to have a break. Hospices are designed to help both the patient and their carer. As well as specialist healthcare staff, hospices will have access to counsellors, chaplains and social workers to address all your family member’s needs. Care at end-of-life – Some people may decide that they do not want to die at home. If this is the case, an admission to a hospice can be arranged to help patients and their families as death approaches. Many hospitals have specialist palliative care staff who can assess your family member’s needs, provide advice on treatment or services and help to coordinate their care. A decision to remain in hospital or be discharged will vary according to your circumstances, medical advice and both you and your relative’s preference. 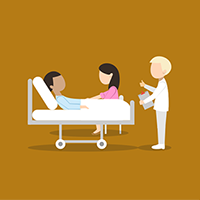 You should be aware that both your relative and you, as a carer, have rights associated with a hospital stay and also discharge from hospital. Again, services vary across Ireland but a useful guide is available here. A residential home may be a suitable placement for your relative if it has become too difficult to care for them at home but they are not expected to die in the near future. Residential homes vary in what they provide. Some residential homes have staff who can help your relative with daily living tasks such as meals and bathing while other homes may have 24-hour nursing care. If you and your relative would like to consider residential care you should discuss the options available with your GP – they can arrange an assessment, discuss suitable homes in your area and explain how the home will be paid for. Residential homes do not have a doctor on site so, while your relative is a resident of the care home their GP remains responsible for their medical care. Residential homes are staffed by a range of healthcare workers. If you have a question it is best to discuss it with the residential home’s manager and, as you get to know and trust the staff, you will learn who the best person to answer particular questions is. What if more complex care is needed? Staff in residential homes will work under the guidance of medical staff in their locality and can contact specialist healthcare staff for advice on physical symptoms, psychological, emotional or spiritual care and, family support. Your relative's GP will also be able to contact relevant services to get advice and guidance on the best way to provide care. If you and your relative make a decision about where they should live and then decide it is not working out, you can change your mind. So, if your relative is being cared for at home and it becomes too difficult alternative placements can be discussed with your healthcare provider. Or, if your relative is in a residential home and it is not what you expected you may be able to arrange for them to come home with support. Making a decision to have a relative cared for somewhere other than their home is difficult. Remember, you are making a decision to provide your relative with the best possible care in the most appropriate location and, if you wish, you can continue to help healthcare staff by providing ‘hands on’ care.